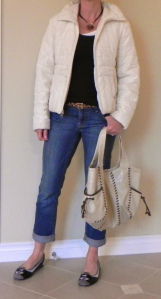 Let me share with you a little story… if you are a long time reader you will know one of my all time LEAST favorite looks is tennis shoes with jeans, especially ‘mom jeans’. 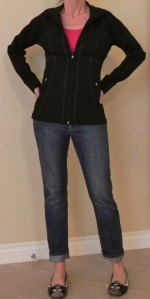 Sigh… I realized that she didn’t quite understand what I meant when I said no tennis shoes with jeans. She thought I mean NONE. EVER. PERIOD. The thing is, there are some versions of tennis shoes that are actually quite cute- and will look adorable with skinny jeans, or whatever you are wearing. Puma in particular has come out with an incredible line of ‘tennis shoes’ that are actually styled to look like ballet flats (which happens to be my favorite shoe of all time). So readers- when I say don’t wear tennis shoes with jeans I mean the old clunky tennis shoes that you wear to work out in (as seen above right). Instead, invest in some cute, streamlined ballet flat style ‘tennis shoes’ and your feet will be comfy, and toasty (although you CAN NOT wear socks with these. EVER) and stylish! Obviously my favorite are the Puma ones, which you can see here but there are some other cute ones as well, as seen here or here. Here are some more examples of outfit for you! Mom jeans and tennis shoes- a HUGE ‘no no’ in my book! By switching out the mom jeans for dark skinnys, my legs look leaner and the ballet flats (my Pumas would have looked cute here as well) complete the look. Even if all you are wearing is a tank and a zipped up hoodie, these streamlined tennis shoes are so much cuter! Very simple and casual ‘everyday mom’ look! *These are all old pictures that you might recognize from older posts, sorry! I’m still flat on my back wearing my sweats. I totally agree. Americans need to up their footwear game. Exercise shoes should only be for let’s see… exercising! And the large white ones are the worst. Should be made illegal for anyone under seventy to wear them. By the way, I love your before and after pictures. I bought the Puma ballets because you raved about them (and the reviews on Zappo’s were over the top great) and I wear them every chance I get. They are amazing. Yes, I am a bit obsessed with them!! I do own some puma flats and love them! Another alternative is toms or converse! I hear ya! My feet used to be so sweaty (and stinky) that it was embarrassing taking my shoes off (when I went sock free) in front of people because it was so bad. One thing I did was spray my feet with anti-perspiant and deodorant every day. After a while- this honestly helped! I also sprinkled powder (Shower to Shower) in my shoes every day. Thanks, Megan. I think a pair of Converse is in my future. I’d like to see the hush puppy type shoes you mentioned but the link is broken. Would you please fix it when you get a chance? Agree — what can I wear with socks besides boots when it’s 45 degrees? And can you put links to some styles other than the Puma ones just for variety’s sake? Thank you, I love your tips!! I love my Puma flats so hard that they are on the verge of disintegrating. I keep looking for replacements, but every similar style I’ve tried since then is just a little bit too stiff for my cranky feet. Sigh.